X-rays, also called radiographs, are typically taken in a dental office or dental specialist. X- rays help dentist be able to see areas inside your teeth and gums that can’t be seen with a simple oral exam. 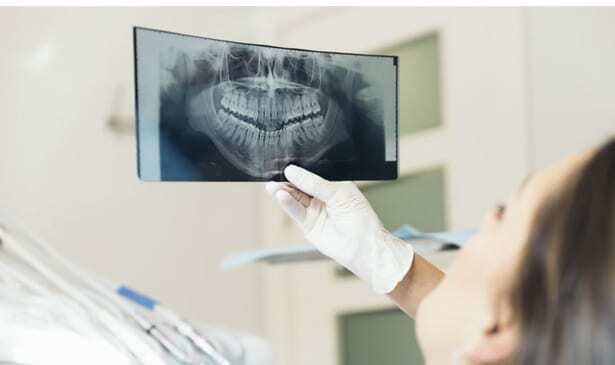 X-rays also help the dentist find and treat dental problems early before they become more serious, which can save you money, unnecessary discomfort, and maybe even your life. • Help dentist to see between and inside your teeth. • Can view the roots of the teeth. • Can detect cyst, abscesses, and any other masses. • Congenitally missing or impacted teeth such as wisdom teeth can be identified this way. • The extent of bone loss due to periodontal disease is easily seen with X-rays. The frequency of getting X-rays of your teeth often depends on your dental history and current condition. X-ray machines and other sources of dental radiographs are designed to minimize radiation. Many dental offices are now using digital X-rays, which does reduce the radiation exposure. Patients will be draped with a leaded apron to cover the abdominal area and a leaded collar to protect the thyroid. Always let your dentist know if you’re pregnant or breastfeeding. Dental checkups and routine X-rays are necessary for a healthy mouth and to help keep your teeth perfect for a lifetime.